UberSoldier makes you a Nazi tool that rebels against his masters. The leading Nazis of WWII were known to experiment with black magic, in the hopes of gaining supernatural powers that would give them an advantage over the Allies. One of these experiments led to the creation of zombies -- undead soldiers who felt no pain. You are one of these experiments, but instead of becoming a mindless drone you've kept your intelligence and free will. When you see what they've done to you, you'll battle against your former comrades to get revenge. 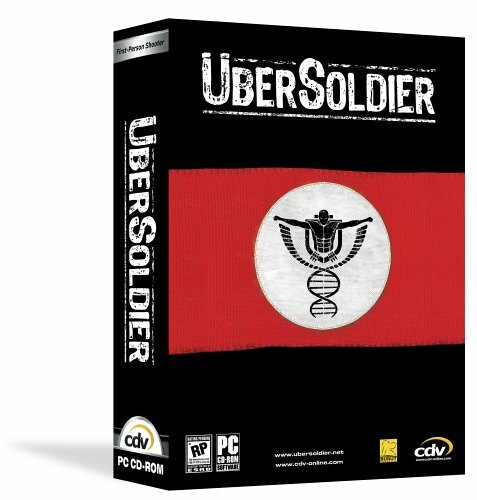 In Ubersoldier, you become an elite German soldier who was killed in an ambush by the French Resistance in 1944. Fortunately for you, your chances to serve the homeland aren't over, because the SS are running a program in which they resurrect the dead, turning them into fearless "Ubersoldiers" with paranormal powers. You wield a handy knife for gutting foes, as well a number of authentic WWII weapons. View larger. You even get to control a sub's torpedoes during one mission. View larger. The graphics for the weapons and environments are first class, with excellent detail and sharp textures. View larger. Unfortunately for the homeland, the dead obey the first person who speaks to them after their resurrection, which in your case means a German resistance operative who has freed you from the SS labs for her own ends. Now, rather than faithfully fighting for the Fatherland, you will try to undermine its efforts by putting an end to the entire Ubersoldier project. 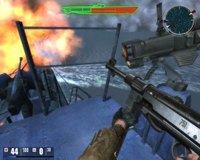 A straight-up first-person shooter, Ubersoldier focuses on the action. You wield a handy knife for gutting foes, as well a number of authentic World War II rifles, pistols, submachine guns, and grenades. 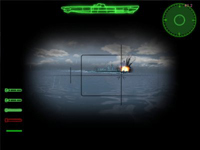 You even get to control a submarine's torpedoes and anti-aircraft guns during one mission. The graphics for the weapon models and environments are first class, with excellent detail and sharp textures. One of your paranormal Ubersoldier powers is the ability to put up a bullet shield, which can stop bullets in their tracks Matrix-style. This ability is limited, however, as it is powered by a meter that gets re-charged by racking up head shots on your enemies in rapid succession. If your meter is powered enough, you can actually bounce bullets back at the enemies who shot at you. 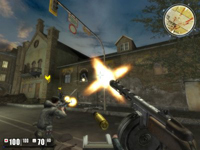 The graphics of the effect are spectacular, featuring a blue shimmer that actually suspends the individual bullets in midair. The campaign in Ubersoldier takes you across a slate of secret research facilities, bombed-out cities, military bases, and the aforementioned U-boat as you work for the Allies. Firefights are fast, frequent, and bloody, and the weapons feel as they have real force to them. The enemies in Ubersoldier are not exceedingly bright, but they're often cunning and extremely reactive. They will open up their machine guns the moment they see you and will heave grenades that will force you to clear out quickly -- that is, if you're not blown up first! In Ubersoldier, the ESRB-mature rating is for good reason. When you shoot a guy, the nearby walls and floor run red with blood, and if you hit him in the face a few times, you're screen will soon fill up with a reddened, leaking pulp. If an enemy has the misfortunate to end up in close proximity to a grenade blast, he will grab his head and stumble about, wailing in agony until you put him out of his misery. In fact, putting a few enemies temporarily out of service with a grenade, only to finish them off while they scream and suffer, is a macabre but effective technique. You will get to see some cool scripted events too, such as an enemy falling off a rooftop after getting shot, only to hit a power line in an explosion of sparks on the way down. The designers thoughtfully scattered just enough explosive fuel barrels and oxygen tanks around the levels to add to the mayhem, creating loads of smoke and fire, flying bodies and debris. Indoors, the game takes you from dank sewers to a plush auditorium, from a disgustingly urine-soaked bathroom to human experimentation laboratories, and everything in between. The lighting effects are well thought out and vary from location to location, and the walls and floors are liberally decorated with appropriate furnishings and odds and ends. The backgrounds are all animated, with air-duct fans that rotate, large pieces of machinery that chug and whirr, and control panels that blink and flash. 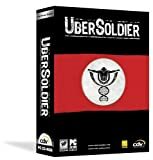 Not for those who are squeamish or too easily startled, Ubersoldier boasts smooth battles that have plenty of visceral carnage, well-paced missions, and an overall strong sense of forward momentum that keeps you active without ever feeling harried. Wow. I've played a lot of games for the past twenty years and I've come across some stinkers. Usually a game has no imagination, is boring or buggy. Ubersoldier is all those things. I couldn't believe the lack of effort the creators of this piece of scheisse put in. It could've been interesting with a zombie FPS but there is nothing done here which could pass for entertaining or credible. I've seen crappy Sci-Fi channel flicks with better plots. The most atrocious aspect of this game is the voice acting. There have been kindergarten plays with better acting. It's heinous. Truly, truly, truly the worst I've ever heard. I could go on forever explaining how bad the gameply is, poorly designed levels, limited weaponry, sluggish movement, insipid story, etc. Oh dear, where do we start. My brother bought me this game on a whim because he found it for four dollars. Where did he find it? donno. But apparently four dollars can buy you one hell of a frisbee. Obviously, the first impressions of a game are going to be the graphics. Being released in 2006 should give you a vague idea of what it looks like. It's kind of stuck between current and next generation engines. They just missed the mark. Not incredibly bad, but no wow factor, especially for today. Being able to see heat is probably the only notable thing about it. Think Far Cry meets Call of Duty... 1. Actually CoD1 looked better than this. Laughable. Even for a videogame. I swear a 9 year old must have written this monstrosity. Something about super soldiers, rebels... and that Nazis have to die. I honestly have no idea what it is about. Honestly. I think you play as a german in WW2, but you fight against germans. That's about as much as you are going to get out of it. Then they go off and kill off the only character that you found remotely interesting in a weak firefight... but i swear you see him later in the game... or that may have been someone else... I don't know... all the character models look the same. But in all seriousness, they don't explain ANYTHING. It's a clusterf*#% of bull$@&%. Run of the mill FPS. You run, you gun. You spray, you pray. The inventory menu is something like PREY where it shows you what weapons you have up top, but you can only carry one of a certain type of gun. That's lame. I mean, I want the cool heavy machine gun, but I only have 7 bullets for it, and I KNOW I'm not going to find any ammo for the rest of the level. So I have to stick to the gun that every german soldier that I encounter has so I have plenty of ammo, but it has terrible aim and I need to unload an entire clip into a guy to bring him down. Stupid. Just let me carry all the guns. The story is unbelievable enough; let me believe that my "super soldier" can rambo it and carry loads of steel. Also, the enemy AI is a tad too aggressive. Especially when you can spit more accurately than shoot. This is the first FPS I've played where aiming down the scope doesn't actually help. You walk into a room, or stand in front of a door, and you know a handful of baddies are going to run in, and they all know exactly where you are. Even when you are hiding behind something, they pour bullets on top you with pin point accuracy. Maybe I'm supposed to make use of my 'superpowers' or should I say 'superpower,' the time shield, an interesting concept. By pressing the Q button, I can put up a blue bubble around my character that stops bullets from reaching me. Okay that's pretty neat, but give me something else! Geebus I was bored with it by the second stage, in fact I forgot that I even had it because it only lasts a few seconds before it has to recharge. And what's with the HUD? I can understand the health and ammo numbers, but what's the blue bar? Does that have something to do with my time shield? What are the skulls and symbols for?! SOMEBODY CLUE ME IN ON THIS... PREFERABLY THE DEVELOPERS! and saving... don't get me started. I got hella far in a level, and had thought that I hit a check point because a small message appeared when I reached a certain area. But when I walked up a stair case some nazis shot something that exploded right next to me, killing me instantly. I thought to myself, 'okay, that's alright, the devs probably just wanted to make it fun by having me learn from my mistakes and retry the area knowing the ambush awaits.' However I was pleasantly pissed when I found that I had to restart from the beginning of the level. I shut it off and walked away. I can only take so much crap in one sitting. Is it so hard to make an auto save feature? ...or lack there of. Each location is tedious and awful. Some doors open up to rooms with absolutely nothing in them, no ammo, no health pack, nothing. Just some chairs, and maybe a window. They serve no purpose and in these types of games I don't exactly feel like exploring. This beats the doors that don't even open. I normally wouldn't nit pick at that, but when the doors that are painted onto the walls look EXACTLY like the ones that do open, it gets a little frustrating. Change the color, put a symbol on it, make it flash, SOMETHING. The general layout of each level is either predictable or awkward. Narrow alleys, maze like complexes, long stretches with no cover, it never ends. The FX is decent, but the voice acting is what I really wanted to rant about. This is some of the, no this IS the worst voice acting I've ever heard. I would say you need to hear it to believe it, but I hope you don't subject yourself to this game in order to find out. Just take my word. It lacks emotion, proper casting, and general talent. Some say that it is on par with Far Cry, but i respectively disagree. It's so far below, and I thought Far Cry's voice overs were awful. I cringe every time the protagonist speaks and the female lead does a wonderful job at making me laugh with every line. The Nazis don't help either. They sound remarkably like... Americans. Poor game sound keeps going out.